So it was billed as “High Stakes” and Andre Berto was to be Floyd Mayweather’s last opponent. As usual the press conference was in LA with the announcement of ticket sales for the following day. Purchasing tickets was not a problem, my flights and the MGM had been booked for months. When I arrived at the MGM it had a strange feeling to it, compared to May when it was really busy with people and an electric buzz about the place but here I was in Vegas, Let fight week begin…………..
Tuesday saw the Grand Arrivals of the undercard and the main event. This was held in the lobby as usual and I managed to get a good view. There were a lot of Brits there and huge support for George Groves was heard, many a time the MC mentioned about the number of Brits there. As usual Floyd likes to keep you waiting and when he arrives he takes the time to stop, sign autographs and have pictures taken with fans. He eventually arrives in the lobby to cheers from the fans and steps up on stage for an interview. Every single person wants a picture of him. He gives his interview and thanks the fans for turning out. He chants “Hard Work” and the crowd chant back “Dedication” He’s asked will he go for the 50-0 his reply “I need to focus on Saturday night and those 36 minutes of work first”. He’s ushered away in the lobby to go and speak to the press, his minders known as “The Great Wall” surround him, no one can get near him. Wednesday saw the open workouts of the guys on the undercard. A full size boxing ring up in the casino near the Sports Bar, again George Groves got a roaring welcome from the Brits. Each fighter performs a workout for the fans and then a brief interview about the fight. It was a good afternoon and a great opportunity for fans to watch the boxers. Of course everyone knows Friday is weigh in day!! As usual it’s held in the Grand Garden Arena from 12 noon. There were no problems in getting in this time, plenty of room for everyone. They sure know how to conduct a weigh in over there and I’ve been lucky enough to attend quite a few. An MC with Floyd’s DJ playing the tunes, they have competitions and give away free stuff plus they have singers & rappers performing sets. It’s an event in itself. Lots of fans there wearing TMT hats and t shirts, the weigh in is always atmospheric watching your favourite standing toe to toe against his opponent for the last time before fight night. Surprisingly enough this time round, we didn’t wait that long for Floyd, as usual he was surrounded with his huge entourage and in his interview again he thanked his fans and said he was ready and focused for Saturday. Saturday came, it was fight day in Las Vegas and it felt good as always. Although walking to the arena had a strange feeling to it, I was walking that walk for the last time to see Floyd. Jimmy Lennon Junior introduced Floyd to the ring for the last time.The music started “The Money Team” played by Floyd’s own DJ. The crowd erupt into cheers as the he enters the ring and he acknowledges the crowd. 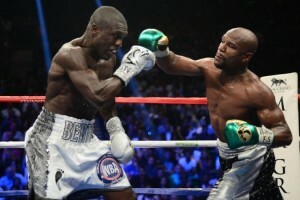 Personally I thought the fight was good and Berto wasn’t afraid to let his shots go. He was there to fight rather than the “pay day”. Floyd did his thing as usual, bobbed and weaved, hit but don’t get hit and he even did the Ali shuffle towards the final bell with cheers from the crowd. As the last bell rang I saw Floyd bend down on both knees, look up towards the sky and kiss both gloves, for me this was a poignant moment. I had just witnessed history being made. A points decision taking Floyd to 49-0 and in his interview he thanked all his fans for the last time and confirmed that was his last fight and he was retiring. Having been a fan for 19 years, getting up at 2am to watch him fight live on TV and luckily making the last few trips to Vegas to watch this master live, I’ve been very fortunate and glad I’ve witnessed history being made. 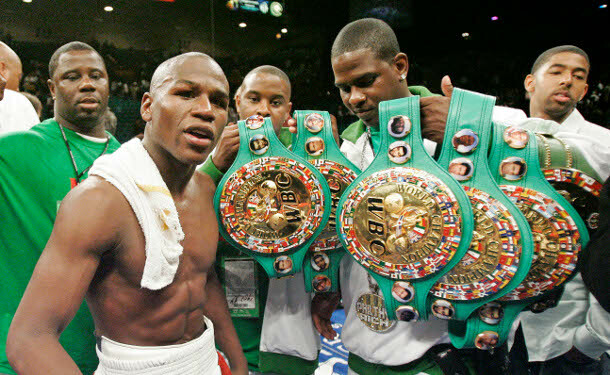 Floyd, thank you for all the memories.